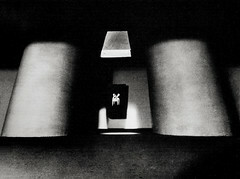 sculpture: model for Memorial to the Atomic Dead, Hiroshima (unrealized proposal), 1952. This photograph depicts the below ground portion of the memorial. Two massive supports surround a central granite block inscribed with the names of the dead. The calligraphic symbol inscribed is for "Isamu" meaning "courage". Noguchi apparently added this inscription to the model after the design was rejected by the City of Hiroshima. The stated reason for the memorial's rejection was that the design was too abstract for common people to understand as a place to pray. The actual reason the project was rejected was the fact of Noguchi's American citizenship. It was felt inappropriate to have an American design a monument for an act of horrific destruction perpetrated by Americans. This photograph is almost always shown with an image of the above ground portion of the memorial design. There are several distortions and contradictions that are evident when the two images are viewed as if taken of a sectional view of a model depicting the above and below ground portions of a singular model. One problem I've noticed is that in the typical montage shown, the massive concrete supports below ground are somewhat misaligned with respect to the memorial arch above. In correcting and adjusting the two images to fit together, I came to realize several things about the design. I was always mystified by the trapeziodal opening admitting light to the below ground chamber containing the names of the dead. In Noguchi's design, the names were to have been inscribed on a massive granite block. The means of support for this block is vague at best. I could only assume it must be positioned up against a wall and supported in that manner, giving the illusion of a floating mass of black granite. However, the trapezoidal skylight seemed positioned in a very particular manner to admit light from above to create a special aura. I couldn't imagine that Noguchi's design hadn't accounted for the position of the sun, shadows, times of day, and the seasons of the year. I just couldn't reconcile the below ground image with the arch above. Investigating further offered more information, but additional complications. Archival image from Isamu Noguchi: A Study of Space by Ana Maria Torres (New York: Monacelli Press, 2000).